Stewed tomatoes are so easy to can. We use them in place of store-bought canned chopped and whole tomatoes. They are wonderful to have on hand. Plunge tomatoes into boiling water (in your cooking pot). Leave them there for about 10 minutes or until you can see the skins splitting. Carefully, transfer them to your sink which you have filled with cold water (and maybe even some ice cubes). This stops the cooking and cools them down so they are easier to handle. Dump your hot cooking pot water outside (it will kill weeds for you- and grass, so be careful- or down the tub drain). Peel the tomatoes, chopping them into quarters, and return them to the cooking pot. Bring tomatoes to a boil. Ladle boiling tomatoes (and the juice) into clean jars to within one half inch of the top. Put lids and rims on immediately. My mom calls this method "open kettle". Because the tomatoes are boiling and there is nothing but tomatoes in the jars, many people don't feel the need to hot water bath them. Simply let them stand and as they cool, they will seal. If you are uncomfortable with this or would like added assurance, you can hot water bath them for 10 minutes. In the past, I regularly used the open kettle method with stewed tomatoes. More recently, I choose to hot water bath them for added assurance although both ways work well. Yes, I can. Ouch! I can feel you pelting me with tomatoes. That is not one my recommended uses for them, but I'll go ahead and stop pushing the sandwich... and mop up the floor. You leave your tomatoes in the boiling water for 10 minutes?!? Aren't they mush by then? I just put them in for 10 seconds and then lift them out into cold water. Plenty of time to get the skins loose. 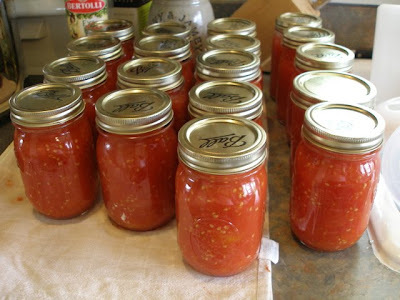 I do a similar method of tomatoes only after scalding and cooling the tomatoes, I wedge them up straight into the jars, pushing them down til they form juice to within 1/2 inch of the top. Then I put a scant teaspoon of salt in the top of each jar, the lid and ring, and put them in a hot water bath. Because the tomatoes are raw, I boil the water bath for about 20 minutes. So if there's anyone nervous about open kettle canning, this is another method (not that I'm nervous about it...I open kettle quite a bit, just not my tomato chunks!). Wow, Zoe. It takes a good 5 minutes for my tomatoes' skin to split so I can peel them easily. They don't turn to mush, but they do get soft and by the time they are brought to a boil (to can), they are 'stewed' and not whole tomatoes (like store-bought). Thanks for contributing your variation:-). Did you really mean it takes 10 even 5 minutes to scald tomatoes. I plunge juice tomatoes 3 or 4 at a time into boiling water (they must be able to move freely), give them 10 seconds and than remove them with a slotted spoon immediately to chilled water. Using the tip of a paring knife to grab the skins they skin very nicely without any of the precious outer flesh of the tomato going along. Roma tomatoes take more like 20 to 30 seconds. Their outer flesh tends to want to stick to the skin no matter what I do. 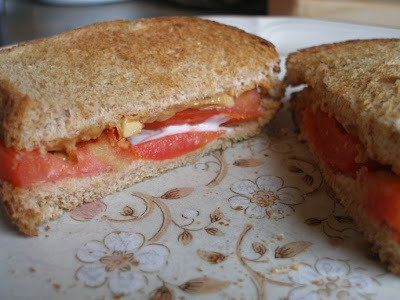 As for your favorite sandwich, I would think it odd but for the fact that my 25 year old son has liked peanut butter and jelly sandwiches dipped in salsa since he was first introduced to salsa in middle school. I prefer peanut butter with jelly, in cookies or in icing on top of chocolate cake. You may have it in your main dishes. You ladies sure have been making me think about my tomato peeling technique! I think a combination of two things are coming into play here. One, when I peel tomatoes I am almost always dealing with a large amount of tomatoes. This means I'm using my largest stew pot and plunging as many tomatoes into the pot as I can. This may mean that it is taking longer for the water to return to a boil, especially when the tomatoes have sat accumulating in the fridge for a few days, which is often the case since I use standard slicing tomatoes for my stewed tomatoes and save the Romas for saucing (we plant way more Romas than any other kind). If the water has to return to a boil and there are many cool tomatoes in there, it may just take longer. Two, I hate peeling tomatoes. I really do. I've found that the longer I let them in the hot water, the easier they peel, thus, the less time I spend peeling. If I leave them in for 5-10 minutes, the skins slip off almost completely when I merely pick the tomatoes up. For stewed tomatoes, it doesn't matter if the tomatoes loose their shape a bit and get a little soft if they do spend a little time in hot water. It's always good to really think about why you do things the way you do them. Thanks, ladies, for making me think:-). Love the "look" of this site - 1st time stewing tomatoes (romas) & I left the skins on...why not? only 4 my use & I eat them raw. any problem??? Thanks for the encouragement to Open Kettle process - I did...hopefully I'll be around next year @ this time to try again. inbeulahland, I'm so sorry. It's so frustrating when these projects don't turn out how you expect them to. My guess is that you just had some extra juicy tomatoes. Were you careful to only remove the skins and not any extra "meat"? You can always strain out excess juice when this happens. Also, once you've peeled your tomatoes, if you fear they will be extra juicy, you can set them in a colander to drain a bit. You don't want to press out the juice, but sometimes they can retain a little bit of the water you cooled them in if you used that method. I don't know if any of this has been helpful. I don't think you did anything wrong. It must have been your tomatoes and hopefully some of the ideas above can help improve your tomato to juice ratio for next time. Fascinating! If I remember this come tomato time, I may give it a try. Thanks for the tip! Hi! This is such a wonderful blog and full of so many ideas I want to try! I have a question ... I am wondering if you have any ideas of what I can do with an excess of cherry and grape tomatoes! My garden is doing much better than I expected and a typical morning picking can be at least 5 pounds of these types of tomatoes. At first I could keep up but I think even my neighbors have had their fill of bags left on their doorsteps. Do you think I can incorporate them with regular tomatoes in some of your other recipes, freeze them or what do you think? THANK YOU! I hadn't gotten to that first post yet so thank you for pointing it out. The difference between your experience and mine is that I actually did plant seed for all of my grape and cherry tomatoes!! LOL My problem, which I guess isn't really a problem but great fortune, is that all the tomato plants (5 varieties) I planted, survived and are busting at the seams. I have found recipes from books and other online sites but it is nice to know that the recipes you post, you actually use and love. So thank you again for sharing! I wanted to let you know that I LOVE your website. I have used many of your recipes for preserving and have passed them on to 2 of my best friends who are using them as well! I am very thankful to have your website as a such a wonderful resource as this is my first year to can foods! I did 16 quarts of the stewed tomatoes yesterday and they all sealed well. I do have a question though, was I supposed to add lemon juice to the stewed tomatoes because I did not and just want to make sure this was okay. Thanks a bunch! Great job! I'm so glad you find my recipes helpful:-). If you only canned tomatoes (with nothing else added), you do not need to add vinegar or lemon juice because the tomatoes themselves are acidic enough. So, no worries! And keep up the good work:-). I canned tomatoes for the first time yesterday. I just wanted to make sure before too much time had passed that it is okay that I didn't use a hot water bath. I've had several relatives question me...:) and I wanted to make sure that I read your instructions correctly. BTW, they all sealed perfectly...if that is a concern. Thanks so much from a grateful newbee! Not using the hot water bath is a method some people use when the only item you're canning is tomatoes. If you have a nice, tight seal on all your jars, you are likely just fine. This is the way my mother has always done it. When I have time, I often choose to hot water bath them for 10 minutes- it gives me further peace of mind:-). How ripe are the tomatoes when you process them? Should they "give" when you touch them indicating to me that they are ready to eat right that moment or should I catch them a day or two before they get to that point? I appreciate the insight!